Hide this Project (Sumadhura Acropolis) Discover properties in other projects by hiding the ones that doesn't interest you. You won't see them in your searches further but you can unhide anytime later. Hide this Dealer (Kawal) Discover properties by other dealers by hiding those whom you have already spoken to. You won't see them in your searches further but you can unhide anytime later. Hide this Dealer (Prasad Polisetti) Discover properties by other dealers by hiding those whom you have already spoken to. You won't see them in your searches further but you can unhide anytime later. Hide this Dealer (Pragathi) Discover properties by other dealers by hiding those whom you have already spoken to. You won't see them in your searches further but you can unhide anytime later. Hide this Dealer (Himansu Nayak) Discover properties by other dealers by hiding those whom you have already spoken to. You won't see them in your searches further but you can unhide anytime later. Sumadhura Acropolis in Nanakramguda, Hyderabad by Sumadhura Properties And Vasavi Group is a residential project. Tallest Tower in Gachibowli and Nanakramguda. Expansive 30000 sq ft of Grand Club House. The size of the Apartment ranges in between 1245.0 sq.ft. and 2615.0 sq.ft. Sumadhura Acropolis price ranges from 95.98 Lacs to 1.10 Cr. Sumadhura Acropolis offers facilities such as Gymnasium and Lift. The project has indoor activities such as Pool table, Skating rink and Squash court. It also offers services like Library. Bank loan approved from HDFC home loans, ICICI, State Bank of India, AXIS Bank LTD. and LIC Housing Finance Ltd. It is an under construction project with possession offered in Dec, 2019. The project is spread over a total area of 4.05 acres of land. It has 72% of open space. Sumadhura Acropolis has a total of 2 towers. The construction is of 31 floors. An accommodation of 564 units has been provided. Sumadhura Acropolis brochure is also available for easy reference. Hyderabad is a major center for the technology industry generating new job opportunities in the city. This directly impacts the real estate of Hyderabad as it witnesses demands especially in the residential sector. Although, the market caters to every segment in the residential as well as commercial real estate market. Hyderabad has a positive outlook after the formation of Telangana in 2014. This can be attributed to reasons like aggressive infrastructure projects, relatively low rents, and good job opportunities. Where is Sumadhura Acropolis located? Nanakramguda, a prime residential locality for house seekers in Hyderabad. What is available flat size in Sumadhura Acropolis? Flat sizes in the project range from 1245.0 sqft to 2615.0 sqft. What is the 2 bedroom size in Sumadhura Acropolis? 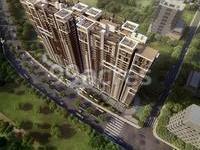 2 BHK units in the project are available in a size of 1245.0 sqft. What is size of 3 bhk in Sumadhura Acropolis? The area of 3 BHK apartments ranges from 1600.0 sqft to 2615.0 sqft. What is the total area of Sumadhura Acropolis?The project spans across 4.05 Acres. What is the price of 2 bhk in Sumadhura Acropolis? 2 BHK units in the project are available at a price tag of Rs. 8700000. Tell me about the connectivity around the project Sumadhura Acropolis in Nanakramguda? I have booked an apartment here for end-use. Also, how is the air quality in this area? Mr. Panchal, this project is located in Nanakramguda which is IT hub in Hyderabad. The area is home to TSI Business parks, IT/ITES special economic zones, Tishman Speyer's, Waverock Building, which houses multinational conglomerates. Located on Nehru Outer Ring Road, ensures sound road connectivity to other parts of the city. Owing to IT hub, this area witnesses healthy demand from working professionals and families. There is no shortage of malls, ATMs, banks, schools, markets and hospitals in Hoodi. Internal roads are good and wide due to which traffic congestion is not an issue here. The air quality index in Nanakramguda according to pollution app named Sameer its less than 50 which is good for residing. What are the various available units in this project for 2bhk and 3bhk? Also, what are the facilities available for senior-citizens in this project?